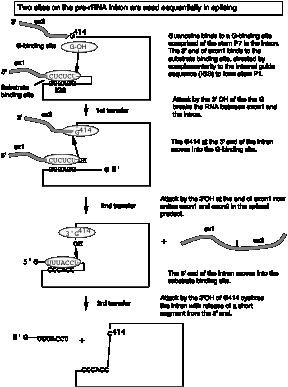 An in vitro reaction was established to examine the removal of an intron from the precursor to rRNA in Tetrahymena. Suprisingly, it was discovered that the splicing of the pre-RNA occurred in the absence of any added protein! The 3'‑OH of the guanine nucleotide is the nucleophile that attacks and joins to the 5' phosphate of the first nucleotide of the intron. This leaves the 3'‑OH of the last nucleotide of the upstream exon available to attack and join the 5' phosphate of the first nucleotide of the downstream exon. 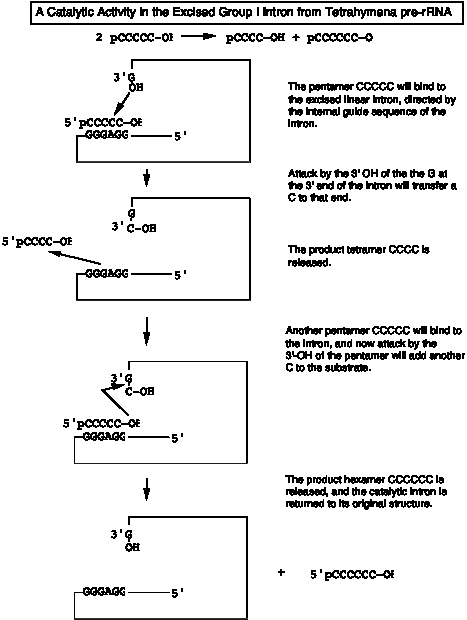 These two phosphoester transfers result in a joining of the two exons and excision of the intron (with the initiating G nucleotide attached to the 5' end.) 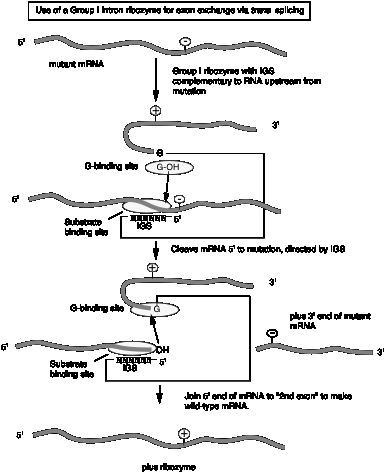 The excised intron is then circularized by attack of the 3'‑OH of the last nucleotide of the intron on the phosphate between the 15th and 16th nucleotides of the introns. Further degradation effectively removes the intron from the reaction and helps prevent the reverse reaction from occurring. Note that the phosphoester transfers are readily reversible unless the products (excised intron) are removed. 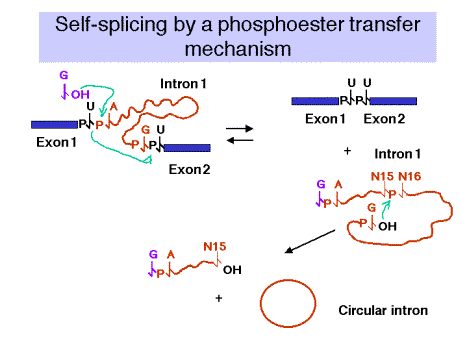 There is no increase or decrease in the number of phosphoester bonds during this splicing. RNA involvement in self‑splicing is stoichiometric, but the excised intron does have a catalytic activity in vitro. After a series of intramolecular cyclization and cleavage reactions, the linear excised intron lacking 19 nucleotides (called L-19 IVS) can be used catalytically to add and remove nucleotides to an artificial substrate. For instance, C5, which is complementary to the internal guide sequences of the intron, can be converted to C4 + C6 and other products (Fig. 3.3.12). The 3‑D structure of the folded RNA is responsible for the specificity and efficiency of the reaction (analogous to the general ideas about proteins with enzymatic activity). 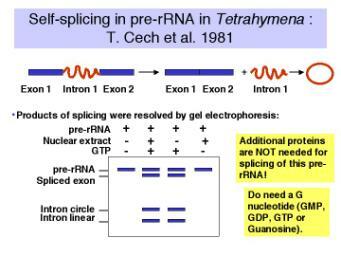 The specificity of splicing is caused, at least in part, by base‑pairing between the 3' end of the upstream exon and a region in the intron called the internal guide sequence. 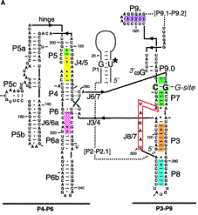 The initiating G nt also binds to a specific site in the RNA close to the 5' splice site. Thus two sites in the pre-rRNA intron are used sequentially in splicing (Fig. 3.3.13 A and 3.3.13.B.). Fig. 3.3.13.B. The catalytic domain of the group I intron from Tetrahymena pre-rRNA, shown in the RNA secondary structure view (left panel) and in a view of the tertiary structure (right panel). The internal guide sequence (IGS) is not not required for catalysis but does confer specificity. Thus one can design RNAs for exon exchange in cells. This potential avenue for therapy for genetic disorders is called "exon replacement therapy.